Gaylord National Hotel & Convention Center is one of the biggest construction projects completed this decade on the East Coast of the United States. This project, located in Oxon Hill Maryland, is the cornerstone of the National Harbor, a multi-billion dollar mega development in the Washington DC area. 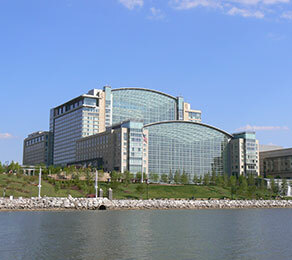 Situated on the banks of the Potomac River and overlooking the Woodrow Wilson Bridge, the Gaylord National Hotel & Convention Center is a 2.5 million square feet (762 km2) project, with a total cost of 700 million dollars. Perini Building Company, one of the largest contractors in the United States, turned to CCL at a very early stage to provide preliminary post-tensioning design for budget development purposes. CCL, with its vast knowledge of monostrand and multistrand systems, provided viable alternatives to the original construction methods. Following the initial consultation and subsequent solutions provided by CCL, Perini/Tompkins Joint Venture chose the company to supply the project with 1,100 tonnes of both multistrand bonded and monostrand unbonded systems. According to Perini’s executive team, the decision to use CCL reflected the full confidence the company had in CCL’s ability to carry out the work and help the contractor through the fast-track construction schedule. CCL completed the project from the initial design to execution within the cost and time constraints and to the complete satisfaction of the client and consultant. The project demonstrated that CCL has the capabilities to supply both bonded and unbonded solutions to a challenging construction schedule.